The world's top ridesharing website has saved around 775,000 tons of carbon dioxide emissions, 100 million gallons of petrol and has created thousands of new friendships. 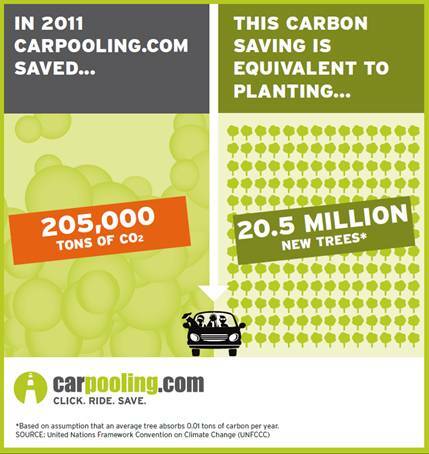 carpooling.com has 3.6 million registered users and provides green transport options for more than one million people a month. Each day, it offers 650,000 shared rides in thousands of cities and 45 countries around the UK and Europe, even ridesharing from the UK to Europe and vice versa, impressive stuff. A spokesman says, "With one billion cars in the world, carpooling.com believes that everyone should have access to affordable transport. "Carpooling.com believes that being on the road can still be cheap, green and fun. Single-occupancy commuting is such a waste of resources. By sharing a ride, people save gas and money, reduce auto emissions and meet new friends. Pollution, traffic, parking and road maintenance are reduced." The website was originally set up by three German students in April 2000 and it now has 45 staff maintaining nine country-specific websites across Europe in local languages, including one for the UK, at www.carpooling.co.uk. Drivers provide details on the website about spare seats, destinations and times and passengers can see driver details, agree costs, book the trip, arrange a convenient meeting place and see if the driver smokes. Passengers can also request journeys. For instance, by travelling by car from Paris to Munich instead of using the train, passengers could pay as little as 20 Euros (£16.50) instead of the 200 Euro (£165) rail fare. Drivers get a bonus, by receiving a minimum 20 Euro fee. In all, it is estimated that drivers and passengers have saved a total of 750 million Euros (£120 million) by setting up journeys through the website last year. By using the free carpooling.com mobile phone app or logging on to the Facebook social media site, passengers can even arrange rides while they are on the move. Passengers who are worried about safety can purchase rides using the carpooling.com booking system, which lists ratings of drivers and passengers based on previous journeys. The average ride rating is around 4.5/5. Women, who are actually the majority of site users - can search rides just offered by women or those who have authenticated their identity. With drivers travelling alone in up to 78% of all rides in the United States and petrol prices rising further, there is still plenty of potential for car sharing to increase. carpooling.com is endorsed by the United Nations Environment Program and is Germany's leading travel portal. Since it began, it has provided 28 million rides. It has even led to 10 weddings between people who met making use of the car pooling service. Follow us @earthtimes or via Facebook.